Poor Lucy was up all night for the second fevered night in a row. Today, after a visit to her doctor and some antibiotics for an ugly sinus infection, we spent the day cozied up in the living room listening to the lighting and thunder outside. These April showers have me dreaming of lush landscapes and hoping we can get going on the back yard sooner rather than later. After talking with our contractor this afternoon we decided that we need to completely regrade our yard and he agreed that a low deck with a gravel bed and a swale underneath could help deal with some of our water drainage issues. He reminded me that any deck we put in could be protected from the rubble of our future basement dig out with plywood and that a flat surface would be easier to work from than the rocky uneven dirt pile that’s there now. After our chat my mind is running wild with ideas for our tiny dirt patch! 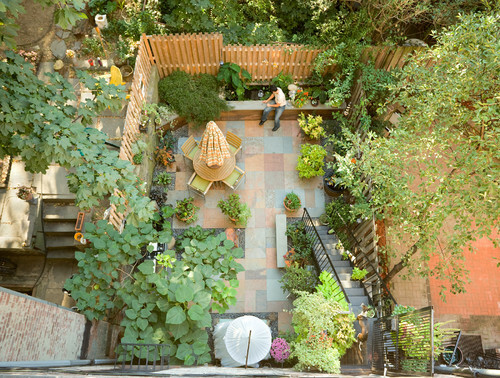 I found some images of beautiful and compact backyards that are inspiring. 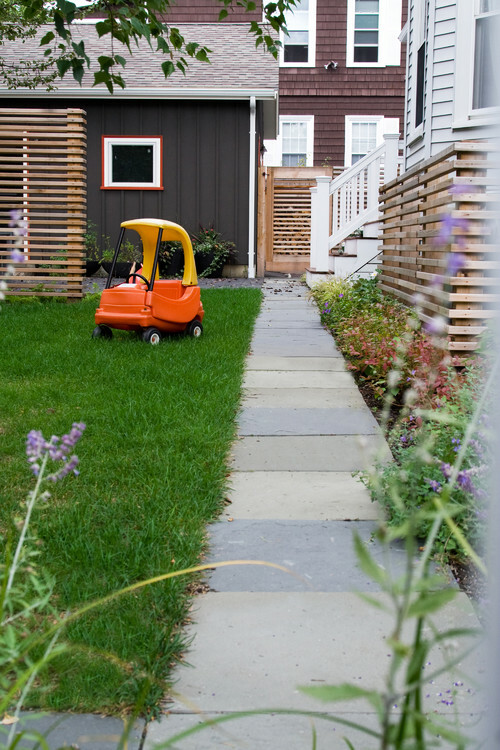 I’d like our yard to be a mix of materials – a functional low wood deck with room for the grill and the table by the back door, stone or concrete paths to the garage studio and the gate to the driveway, as well as a patch of lawn for the dog. If we can I’d like to squeeze in a few puppy proof raised planter beds so we can have a little vegetable and herb garden. Our yard is really a side yard, running along the side of our house because of the way our lot is laid out. Our contractor spent the day cutting new roof rafters in the garage( we basically have to rebuild it from the inside out so it’s a suitable studio space for me) and otherwise reframing the space. I’m so glad that work has started again(there goes that tax refund!) It buoys my spirits to actually see some progress around here. It was also nice to focus on something else instead of endlessly refreshing news websites about the bombing in Boston. I’m not sure if it’s motherhood, IVF hormones, or most likely just being human – but every story from that day has me weeping, and squeezing my loved ones a little tighter. I hope you and yours are happy and together, wherever you are.